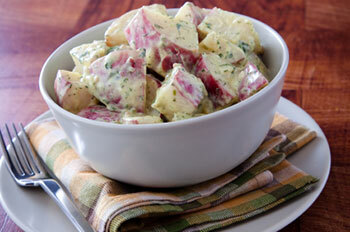 The waxy red potatoes hold together better in a salad than russets. Use Yukon Gold potatoes if you don't want the red skin. The larger red potatoes are easily peeled after boiling � the skins will generally just slip off. Place the water in a large stock pot fitted with a steamer basket. Bring the water to a boil over medium-high heat. Steam the potatoes for about 30 minutes until slightly soft. Remove and let cool for about ten minutes and then chill thoroughly in the refrigerator. Cut the potatoes into 1/2 to 1 inch pieces. Place in mixing bowl and add mayonnaise, sour cream, mustard, parsley, salt and pepper. Fold together gently and chill well before serving.